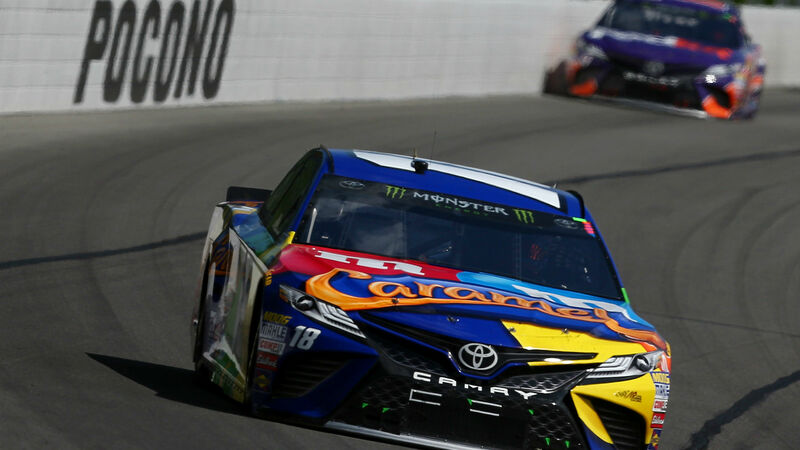 A late-race red flag delayed the race at Pocono Raceway, overtime extended it, but in the end, nothing could stop Kyle Busch. The Joe Gibbs Racing driver held off the field in two late-race restarts to win the Gander Outdoors 400. It’s Busch’s sixth victory of 2018. Busch appeared headed for an easy victory late in the race, but a frightening crash involving Bubba Wallace halted the action. Wallace escaped serious injury when his car lost its brakes and slammed into the wall. On the subsequent restart with three laps remaining, Busch held off a spirited challenge from JGR teammate Daniel Suarez, but hard racing back in the pack sent Aric Almirola spinning and brought on overtime. In the overtime, Suarez again threatened Busch, but Erik Jones challenged Suarez, allowing Busch to pull away. Suarez finished second, while Jones dropped to fifth behind Alex Bowman and Kevin Harvick. Harvick, who had the fastest car most of the race, encountered trouble late when he rubbed fenders with Almirola during a pit stop, damaging his left rear. Busch’s victory is the 49th of his career, tying him with Tony Stewart for 12th on the all-time win list. “Tony Stewart is one of the best all-time drivers, so it’s awesome to be able to tie him,” Busch said.